Well, the Nürburgring 24 Hour race was fun for a few laps. While stormy weather was forecast, nobody anticipated a hailstorm that completely shut down the race. 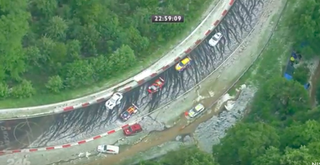 According to reports from the livestream, people at the scene, and our man Robb Holland who’s set to go out there later today, the race has been red flagged thanks to hail, rain and ice. Some 25 cars were involved in a bad crash just a few laps in. Robb says the worst of it happened from Arenberg through to Metzgefeld, although it has barely rained in the paddock area. No word on possible injuries yet. Reports say the race is set to go green in about 90 minutes from now, about 6 p.m. local time, while crews work to recover cars and repair barriers. Update: And now the restart is at 7:20 p.m. instead. Settle in, this could take a while. Update 2: And we’re back, enjoy!